Crème brûlée and crème caramel — the two are easily confused. 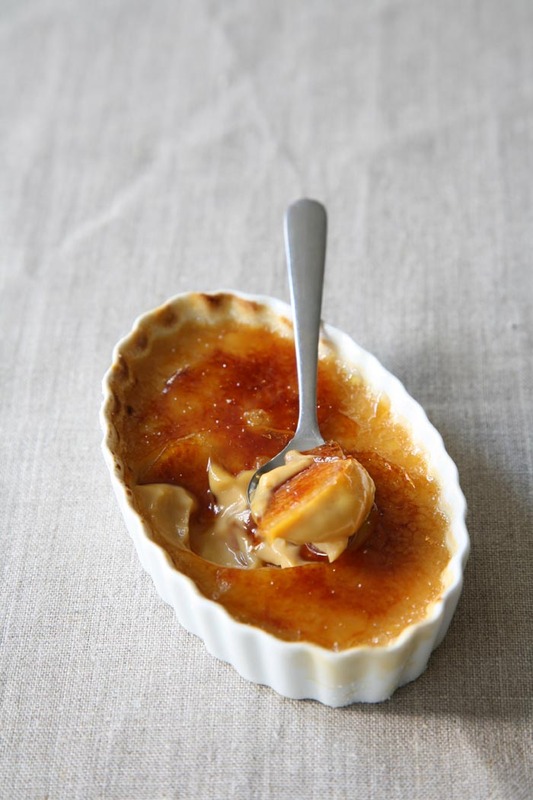 Especially if you take the best part of crème caramel, the caramel, and infuse it in your crème brûlée. Just to set the record straight, crème caramel is the light custard that’s served inverted onto a plate, caramel base up, with the golden syrup pooling dramatically at the base. Crème brûlée is crème caramel’s richer cousin, made with cream rather than milk. It’s dusted with sugar and torched, or brûléed, with sugar to create its distinctive glass-like topping. The best part of crème brûlée is you can make it days in advance and there’s no fancy plating to worry about. Simply take them out of the fridge and allow each guest the pleasure of dusting their custard with sugar and torching it. Children and tispy guests excluded. One of my favourite kitchen tools is a push-button starter for my burly blow torch, given to me by a student, an electrician. It accompanies my crème brûlée to the table no matter how fancy the occasion. The custard is adapted from Julia Child’s crème brûlée recipe, a modified creme anglaise, found in Mastering the Art of French Cooking. Originally published in EAT Magazine’s Jan/Feb 2012 issue. You’ll want to get your equipment organized before you start. You’ll need 10 ramekins and a baking dish, or dishes, large enough to accommodate them. You’ll also need a sieve placed atop a container (pictured below), parchment paper, or tinfoil, a kettle for boiling water and finally, a blowtorch. 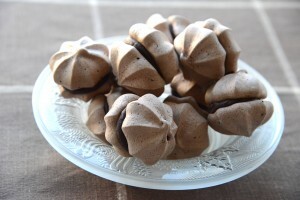 This is an easy recipe but it helps to read the recipe though to the end before you start. Like you always do. Line a large baking dish with small dish-towels or non-stick drawer liners. This helps insulate and hold the ramekins in place while you transport them to and from the oven. Heat the cream and vanilla mixture until it just begins to boil. Remove from the heat and set aside. In a LARGE saucepan (trust me on this), add the sugar and just enough water to moisten the sugar. Cook the sugar on medium-high heat until it melts and turns a light amber color, approximately 7 to 10 minutes. Once the sugar starts changing colour you must be attentive – the sugar can turn into smoking black mess in a heartbeat. Slowly stir the warm cream mixture into the hot, melted sugar. The melted sugar will bubble madly. 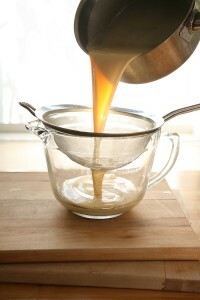 In a large bowl, whisk the egg yolks with a small amount of the hot caramel cream. Add the rest of the cream in a slow stream, whisking until combined. Do not rush this process or you run the risk of scrambling the eggs. Strain the custard through a fine sieve into a one-litre spouted container (pictured), for easy pouring. Place the ramekins on the lined baking dish and move to a counter space that is close to the stove. Pour the custard into the ramekins, filling close to the top. Add the boiling water to the baking dish, being careful not to pour water into the custard. The water should come half way up the sides of the ramekins. Poke a couple of holes into a sheet of tin foil or parchment and loosely cover the baking dish. Carefully transfer the baking dish into the oven. Baking time will depend on the size of your ramekins and your oven’s temperament. Plan on about 25 minutes for small or shallow ramekins and about 45 minutes for larger containers. The custards should be removed from the oven when they’re barely set — with the centers ever-so-slightly wobbly. It’s best to check the custards after 20 minutes to gauge the timing. 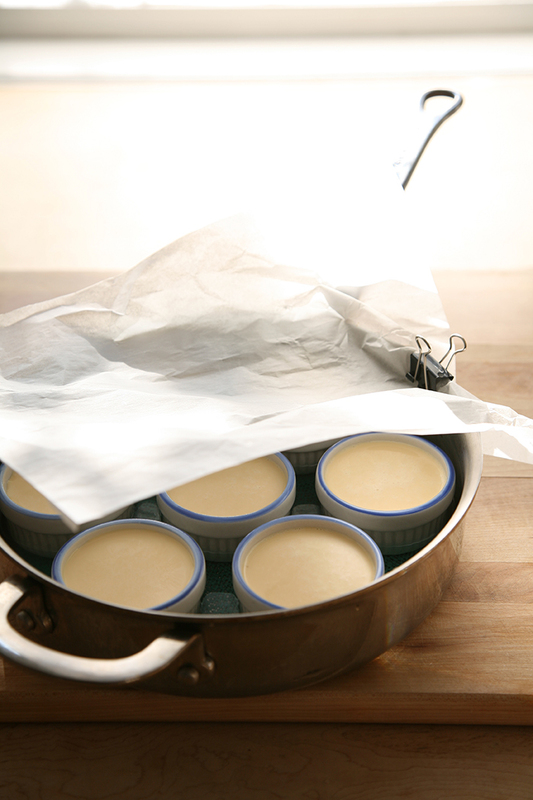 Refrigerate the custards until completely cool, at least three hours. (They can also be refrigerated up to three days in advance). Just before serving, generously dust each custard with white sugar. Tilt the ramekin from side to side to disperse the sugar. Using the blowtorch, carefully burn (brûlée) the sugar with the flame until the top of each custard is nicely browned. If you like your cakes boozy and moist, this yeast cake is sure to become a favourite. Once the cake is baked, it is saturated with warm cherry brandy (Kirsch) or rum-spiked syrup. The cake soaks up the booze like a drunken sponge and swells in a happy stupor. You can, of course, omit the booze and flavour the syrup with vanilla, citrus zest, or any sober flavouring you wish. If you’re nervous about baking with yeast, don’t let that put you off — this cake rises in its mould without any punching down or second-guessing. I filled the hollow of my Savarin with pastry cream mousseline — a simple custard “lightened” with whipping cream. 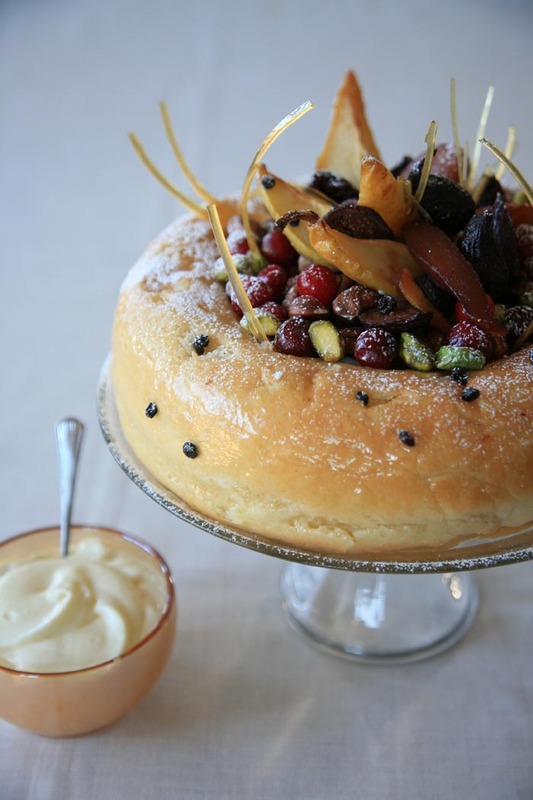 The cake is topped with caramelized pears, pistachios and a dried fruit compote steeped in wine. In the summer, fresh berries would do nicely. Oh, those wispy golden shards poking out of the cake? That’s just a little caramelized sugar for a bit of sweet drama. They’re easy to make and I’ve explained how to do so, below. The dough for this recipe was adapted from Julia Child’s enduring classic, Mastering the Art of French Cooking. Originally published in EAT Magazine‘s Nov/Dec 2012 issue. Makes one Savarin or 8 Rum Babas, depending on the size of mould. Brush mould(s) liberally with butter and dust with flour. If mixing by hand: Dissolve the yeast with the lukewarm milk in a medium-sized bowl. Add the melted butter, sugar, salt, eggs and lemon zest and mix with a fork until well combined. If making Babas, add the currants. Add the flour all at once and, when the mixture becomes too difficult to mix with a fork, transfer it to a floured work surface and knead by hand, adding additional flour as necessary to prevent the dough from sticking. If mixing by machine: Dissolve the yeast with the lukewarm milk in the bowl of a standup mixer. Add the melted butter, sugar, salt, eggs and lemon zest and mix until well combined using the whisk attachment. If making Babas, add the currants. Change the attachment to a dough hook and add the flour all at once, mixing at medium speed until the dough no longer sticks to the side of the bowl. You may have to add additional flour, one tablespoon at a time, to prevent the dough from sticking. You will know that you have mixed the dough enough when you can stretch it into a thick, long rope without breaking it. The dough will be slightly sticky to the touch. Baba moulds: Place the moulds on a baking tray and break off the dough in uniform pieces, filling the moulds only half way to the top. Allow the dough to rise in a warm draft-free area for about 30 – 45 minutes or until it reaches the top of the mould(s). 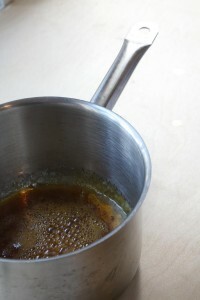 While the dough is rising, make the syrup: combine the sugar and water in a small saucepan and stir, heating gently until the sugar dissolves. Remove from heat and add the rum or Kirsch. If using vanilla, split the vanilla bean in half, lengthwise, and scrape the minute seeds from the pod. Add the vanilla seeds, and the pod, to the cooling syrup and infuse for 30 minutes. 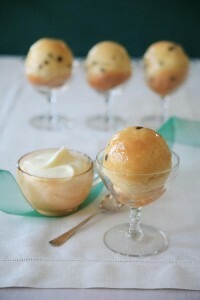 (If you don’t want specks of vanilla seeds in your cakes, strain the syrup through cheesecloth or a fine-mesh strainer.) The syrup will be gently re-heated before pouring it onto the cake(s). When the dough has risen, place the mould(s) in the pre-heated oven and bake until the tops are golden and the dough is cooked through. Babas take about 12 – 15 minutes, Savarins about 25 minutes. Carefully remove the mould(s) and cool on a rack. Using a fine skewer or a toothpick, prick the cake(s) in several places (this will help to draw in the flavoured syrup). Babas: Warm the syrup and pour it in a shallow bowl, such as a deep dish pie plate, and place the cooled cakes in the syrup, turning them over to saturate them completely. Place the Babas onto individual serving plates or dessert bowls and brush with the warmed jelly. Serve with pastry cream mousseline and/or fruit. Savarin: Position the Savarin on a rack placed over a baking pan and pour half of the warmed syrup over the cake. Gently turn the Savarin over and repeat on the other side. Place the Savarin onto a cake platter and brush with the warmed jelly. Fill the center with pastry cream mousseline and garnish with fruit. Dust with icing sugar, if desired. In a small saucepan, combine the milk with half the sugar. 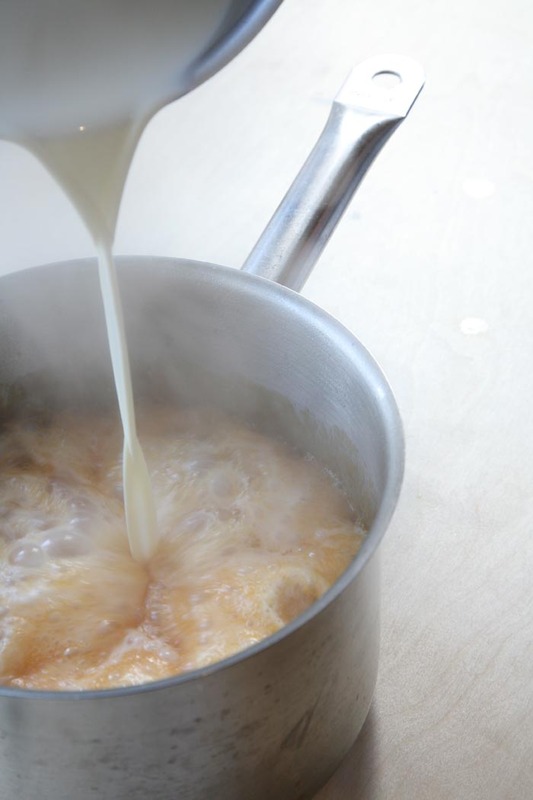 Heat the sweetened milk until the mixture starts to boil. Remove it from the heat. In a small bowl, combine the egg yolks with the balance of the sugar and whisk until smooth. Add the flour and whisk until well incorporated. (The mixture will be very thick.) Add about a cup of the warm milk to thin the mixture; mix well and return the mixture it to the saucepan of sweetened milk. Return the saucepan to the heat and bring to a boil, stirring constantly for about a minute. The mixture (now a custard) should be thick and free of lumps. Pour the hot custard into a bowl, cover with plastic wrap and, when it is not longer hot, refrigerate until well chilled. When you are ready to serve, whip the whipping cream to a soft peak and fold it into the chilled pastry cream. Serve with fruit, if desired. In a saucepan, warm the wine and molasses and remove from the heat. Add the fruit and remaining ingredients to the warm wine mixture and allow to steep for about 30 minutes. When the mixture has cooled, place in a jar and store in the refrigerator for up to 10 days. Serve at room temperature with pastry cream mousseline, Savarin or Rum Babas. Read the instructions to the end before you start this recipe. Line a baking tray with a silicone baking mat or a sheet of parchment paper brushed with a thin coat of butter. In a deep heavy-bottomed saucepan, combine the sugar, corn syrup and water. Bring the mixture to a boil over medium-high heat, without stirring. When the sugar starts to colour (this takes about 5 minutes), swirl the pot to evenly distribute the colour. When the sugar turns golden (this take about 3 minutes), quickly, and carefully, drizzle the hot sugar onto the prepared baking tray. When the sugar cools slightly and becomes malleable — this happens very quickly — carefully drape the sugar-coated mat (or parchment) over a canister or rolling pin, sugar side up. Once the sugar has cooled and hardened, peel it from the baking mat. To clean the saucepan of hardened sugar, fill it with water and bring it to a boil. The flavour and texture of smoked mackerel is unlike any other fish. The flesh is ultra-moist with a smoky complexity that works best with tame ingredients that don’t overpower the fish. 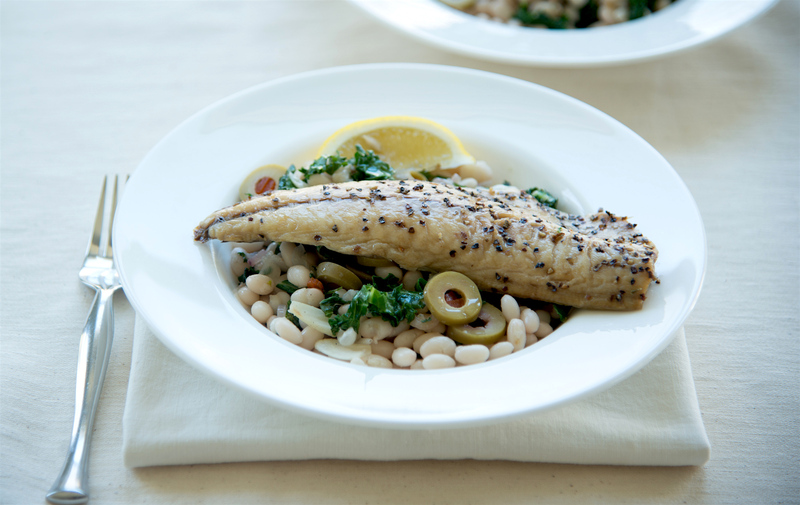 I’ve kept things simple by pairing my mackerel with a salad of white beans, kale, a few green olives and a good glug of olive oil. It’s not fancy, but it’s as comforting as a fleece hoodie on a chilly morning. I picked up my mackerel at my favourite new seafood outlet, The Daily Catch, which is smack next door to my vegetable market; a happy coexistence in Vancouver’s vibrant West End. We’re enjoying a lot more seafood these days, thanks to their well stocked fish counter and ever friendly staff. In a large skillet, briefly saute the shallot in 1 Tbsp oil until aromatic. Add the chopped kale and cook just until wilted — or take it further if you enjoy your kale on the crisp side. Add the garlic and cook just until aromatic, then add the beans, lemon juice and salt. Taste the beans and kale and adjust seasoning with more lemon and salt as necessary. Portion the beans and kale in two bowls and drizzle with a glug of oil. Top each with a mackerel fillet and serve with a lemon wedge. When I tell friends I’m making duck confit they look at me suspiciously, like maybe I skin rabbits or have a gutted deer hanging in my garage. Duck may sound exotic but the only hunting involved is rooting through the freezer section of your local grocer. Where there’s frozen turkey, there’s often duck. 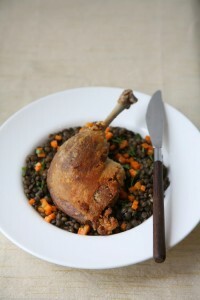 Duck confit is a moist and intensely flavoured meat; tastier than chicken but not at all gamey. The skin crisps up beautifully, sort of like bacon, only better. Confit is made by slowly poaching seasoned duck legs in duck fat (yes, duck fat) until the meat is fall-off-the-bone tender. While this may sound about as healthy as a bowl of poutine, duck fat is actually one of the healthier fats — it’s high in cholesterol-fighting monounsaturated fat. You can pick up duck fat at your local butcher. If they don’t sell it, they’ll likely know someone who does. Use it as you would cooking oil — potatoes fried or roasted in duck fat are sensational. Duck confit has more uses than you might imagine: you can serve it with lentils, as pictured, or shred the meat and tuck it into sweet peppers or ravioli, wrap it in a tortilla with pickled vegetables, mix it with white beans and roasted garlic, purée it into a fine pâté with pepper and cognac, or toss it in a salad, crispy skin and all. Properly stored, duck confit lasts a month in the refrigerator. As if you need more reason to give it a try. The last time I checked, Slaters First Class Meats in Victoria and Oyama Sausage Company in Vancouver, offered duck fat. This recipe is adapted from Michael Rulman and Brian Polcyn’s Charcuterie: The Craft of Salting, Smoking, and Curing. Combine the salt with the pepper, garlic, shallots, fennel, parsley and thyme. Sprinkle half of the mixture on the bottom of a dish large enough to hold the duck pieces in a single layer. Place the duck on top of the salt mixture and then sprinkle with the remaining salt. Cover with plastic wrap and refrigerate for 24 to 48 hours. Heat the oven to 240F. Melt the duck fat in a saucepan over medium low heat. Remove the duck from the salt, rinse thoroughly and pat completely dry with paper towels. Arrange the duck pieces in a single snug layer in a wide, shallow, oven-safe saucepan, casserole or baking dish. Pour the melted fat over the duck. The duck pieces must be completely covered by fat. Transfer the duck to the oven and gently simmer, uncovered, until the duck is tender and can be easily pulled from the bone, approximately 2 to 3 hours. 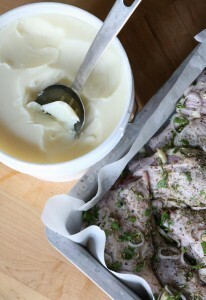 Check the oven occasionally to make sure the fat is gently simmering; confit can become tough if the oven is too hot. Adjust the heat as required to achieve a very gentle simmer. Store the duck in the fat in the refrigerator for up to one month. Excess duck fat can be strained and stored in the refrigerator for later use. When ready to use, brown the duck pieces, skin side down in a frying pan to crisp the skin. Then transfer to a low oven until heated through, approximately 15 minutes at 325 F.